NEWS ANALYSIS: Never before has Norway had a government with more ministers (22) or more parties (four) involved. Prime Minister Erna Solberg has, however made some clearly strategic moves in forming the country’s first non-socialist majority government since 1985, with an eye to winning re-election once again in 2021. Solberg also clearly hopes to put months of political turmoil and even non-socialist challenges to her power behind her. Her Conservative Party-led coalition survived as a minority government since she first won the prime minister’s seat in 2013, and then won re-election with the Progress Party in 2017, but without the support agreement they’d had with the Christian Democrats and the Liberal parties. 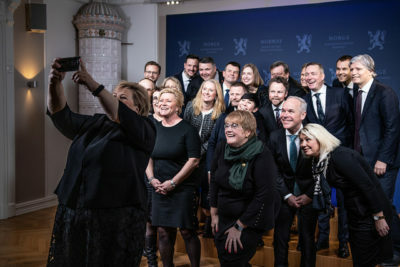 The Liberals ended up joining her in government last January, but Solberg’s then-three-party coalition still held only a minority of seats in Parliament. Now her expanded coalition includes the Christian Democrats as well, and a majority of seats based on results of the last election. As long as all four parties hold together, they’re assured of getting the legislation they want through Parliament. They face a tough and resurgent opposition, however, with the Labour, Socialist Left and Center parties now doing well in public opinion polls. Solberg’s choices in forming her new expanded coalition, however, seem specifically aimed at tackling their strongest criticism and opposition. For one thing, two of the Progress Party’s most outspoken and controversial ministers are now gone: Per Sandberg lost his cabinet post over his highly questionable summer holiday in Iran and careless use of his mobile phone in both Iran and China. Sylvi Listhaug, who succeeded Sandberg as deputy leader of the Progress Party, played a key role in negotiating the Solberg govenment’s new platform but did not, perhaps pointedly, make a comeback as a minister. She had to resign as justice minister last spring after offending far too many in a highly disputable Facebook post. That made it much more palatable for the Christian Democrats, by an albeit slim majority, to agree to join Solberg’s government despite campaign promises that they would never share government power with the Progress Party. With most of Progress’ toughest right-wingers (by Norwegian standards) out of the government, the Christian Democrats saw some potential. Of all the challenges faced by Solberg in Parliament recently, her government’s alleged failure to follow up on anti-terror- and security improvements posed the biggest threat. She survived a potential no-confidence vote last fall, and has now tackled the security and preparedness issue by creating a ministerial post to specifically address it. 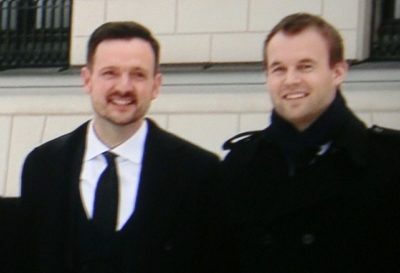 The new post of “Public Security Minister,” moreover, was handed to Ingvil Smines Tybring-Gjedde of the Progress Party, a former state secretary in Solberg’s office and wife of one of Progress’ most outspoken and critical Members of Parliament, Christian Tybring-Gjedde. 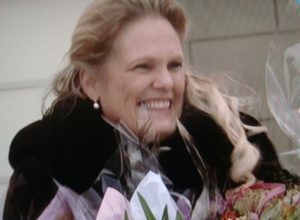 Tybring-Gjedde’s appointment was the biggest surprise on Tuesday, when Solberg presented her new 22-member government after an extraordinary Council of State with King Harald at the Royal Palace. The appointment may dampen her husband’s regular criticism of the government in which his own party serves, while also helping Solberg actually achieve the security improvements needed before the next election. The Tybring-Gjeddes’ daughter Mathilde, meanwhile, is currently serving as a Member of Parliament for Solberg’s Conservative Party, not her parents’ Progress Party. Solberg also needed to make sure that her newest partner in government, the Christian Democrats, got some cabinet posts in areas most important to it. She replaced the Progress Party’s Bård Hoksrud as agriculture minister with Olaug Bollestad, acting leader of the Christian Democrats who long have championed farmers and rural interests. That poses a direct challenge to the opposition Center Party, since the Christian Democrats often side with Center on maintaining protectionist policies, farm subsidies and taxpayer funding for outlying district development in general. Bollestad is expected to carry out the same sorts of policies Center would, perhaps leaving Center with fewer things to compain about. Norway’s largest farm lobby, Norges Bondelaget, was quick to issue a statement on Tuesday claiming that it expects “good cooperation” with Bollestad as the new minister in charge of agriculture and food production. Progress Party leader Siv Jensen, who remains in her position as finance minister, claimed she was “very satisfied” after her more market-liberal party held control of the agriculture ministry since 2013, and claimed it was not a loss to now hand it over to the Christian Democrats. 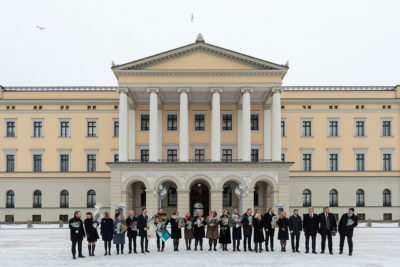 While Solberg’s expanded government has more ministers than ever before, the actual number of ministries stayed at 15, with six of them now containing two ministers. Solberg fended off criticism that instead of slimming down state government, she had expanded it, stressing that there are no more ministries than before. She also shifted around some of her own Conservative ministers, moving the up-and-coming Nicolai Astrup from the foreign ministry as minister in charge of foreign aid and development, to a new post as a minister in the ministry for local governments in charge of digitalization. He’ll be succeeded by former Bergen city politician Dag Inge Ulstein of the Christian Democrats, not least since foreign aid is another key issue for the Christian Democrats. Solberg also felt compelled to replace Linda Hofstad Helleland as minister in charge of family and children’s issues, in order to appease the Christian Democrats and give that responsibility to their deputy leader Kjell Ingolf Ropstad. He led the revolt against former Christian Democrats’ leader Knut Arild Hareide’s desire to support the left-center side of Norwegian politics instead of the conservative side. Ropstad, however, won’t need to march in Norway’s annual gay pride parades, with Solberg transferring equality issues over the Ministry of Culture, under the leadership of the Liberals’ Trine Skei Grande. The Liberals’ otherwise will maintain control over ministries important to them, including culture, equality, the environment and climate and higher education. 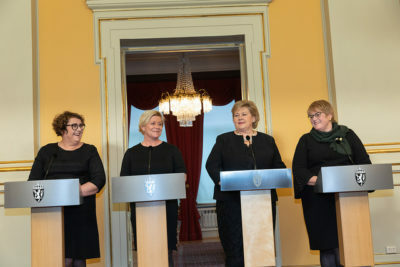 Solberg’s new government also sets a new record as being led by four women – herself, Progress Party leader Jensen, Liberal Party leader Grande and the Christian Democrats’ acting leader Bollestad. That’s always important in Norway, which has promoted gender equality for decades. 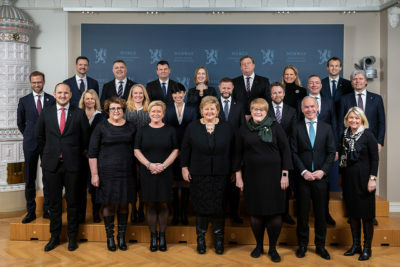 Solberg’s Conservatives retain control of the most, and arguably the most important, ministries, including the Office of the Prime Minister, the foreign, defense, health, education, labour, local governments, trade and, now, digitalization ministries. The Progress Party will politially control seven ministries, including finance, oil and energy, fisheries, justice and immigration, transport, elder care and public health and, now, public security. The Liberals and Christian Democrats will have political control over three ministries each: Culture, environment and higher education for the Liberals, and agriculture, family and foreign aid for the Christian Democrats. “The goal is to create a sustainable society,” Solberg said at her expanded government’s press conference Tuesday afternoon. She thanked the two ministers who needed to leave her government (Helleland and Hoksrud) to make room for the Christian Democrats, and welcomed her new ministers. “We have some intense weeks behind us,” Solberg admitted, in referring to the drama and conflicts that surrounded government negotiations. Now, she said, she thinks Norway “will become an even better country.” The opposition is already gearing up for more battles, however, with some commentators saying they’re now likely to zero in on the controversial change in abortion law (initiated by the Christian Democrats) and the Solberg government’s reluctance to force more emissions cuts and seemingly leave Norway’s oil industry able to keep drilling and producing. For the full list of the new ministers, their official titles and party affiliations, click here (external link).